It's snowing. Two weeks ago we had a lot of snow on a Sunday. Maybe people didn't take the meteorologists seriously last time. 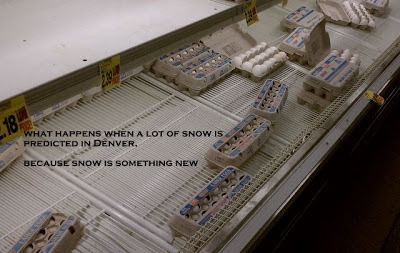 So when they were predicting a lot of snow for today, the general population of Denver sat up, took notice, and hit the grocery store so that they would not starve if they had to stay home to wait out the storm. I'm not sure what it is about snow storms that causes people to go crazy about eggs. They run to the store because omg it's going to snow. And once they get what they really want: ingredients for bloody Mary's, Velveeta, rotel, tortilla chips, and Oreos, they realize: "﻿I need eggs." In the general course of life a person, maybe you, might go a week or two without cooking eggs. But in the heat of battle at the grocery store the night before a snowstorm you decide that eggs are essential to staying home and combating the snow. I'm convinced that all over the state today, french toast, scrambled eggs and omelets are being consumed in epic quantities. To celebrate my Saturday Snowday, I too, felt compelled to cook with eggs. And I made something new. 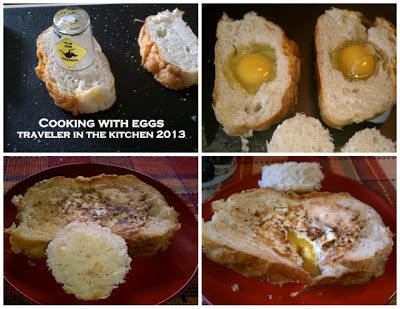 Apparently egg in bread has many names including: Egg in the hole, Bird's nest, or (not sure where this came from) Rocky Mountain Squattled Eggs. Whatever you call it, it's easy, delicious, and a great way to use the egg and bread that you stocked up on in preparation for this most recent storm. Set the griddle on the burner and turn to medium heat. Put a little butter on the griddle. Cut the center out of the slice of bread using a shot glass. 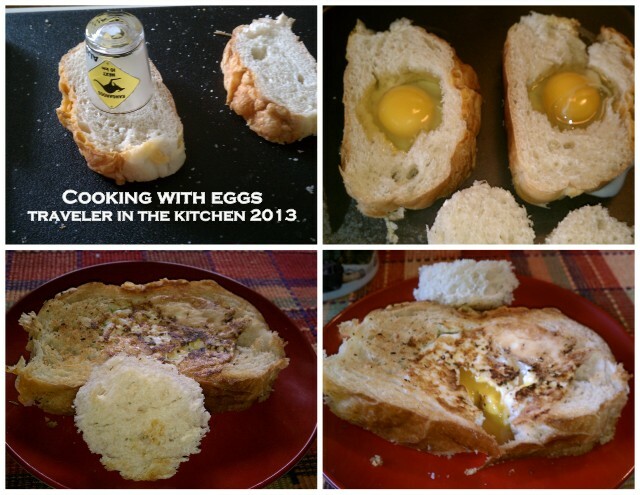 Set the slice of bread on the griddle and crack an egg in the hole. Cook for 3 minutes. Flip and cook on the other side. Slide onto a plate and dig in. I made these for breakfast today. I may have to cook with eggs again later today. Stay safe. Stay warm. Eat eggs. Ha, uncle Warren used to always make these for me and he called them one-eyed Egyptians.